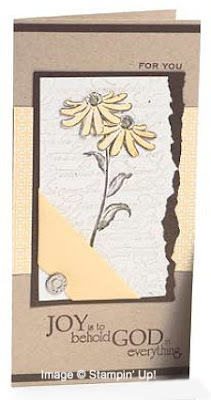 Personalized Stamps - 15% OFF thru July 31st! NOTE: This post will be stuck to the top of my blog until about midnight on July 31st, so please scroll down if you'd like to see the most recent entry in the meantime! Get a personalized return address stamp, a personalized Handstamped By stamp, a Princess or Pirate stamp for a child's birthday, a wedding stamp with the bride and groom's names, a wedding date stamp, or just a big one-line stamp with your name (or make it two lines with your name and phone number). The big name stamp makes a great gift for children, especially those with unique names! 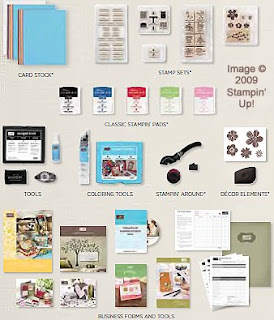 If you have your own home based business, like Pampered Chef, Longaberger, PartyLite, Meleleuca, Mary Kay, Lia Sophia, Avon, Lemongrass Spa, Princess House, Tastefully Simple, Herbalife, Young Living, or Creative Memories, these stamps are great to use for placing your contact information on your catalogs and publications. Click HERE to view the full-size PDF for ordering information. You will NOT find these stamp choices in my ONLINE STORE, you must email me with your order for personalized stamps. I must be able to see all the writing and spaces, along with any capitalization. Please download the full-size PDF above for details on the maximum number of characters (counting spaces, capitals count as 2 spaces) for any personalized stamp. 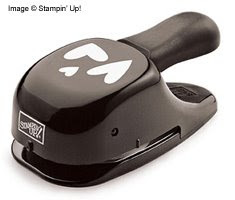 If you need ink for your personalized stamp, I recommend StazOn Jet Black permanent ink (Item 101406, $7.95) because it is waterproof and can be used on paper and card stock, as well as on nonporous surfaces such as plastic. I always recommend the purchase of a reinker with any ink pad, so be sure to add the Jet Black Refill (Item 102566, $4.95) to your order. ACT NOW AND GET 15% OFF YOUR ORDER! OFFER GOOD THROUGH JULY 31ST ON ANY ORDER YOU PLACE THROUGH ME! As I mentioned previously, you'll need to EMAIL ME WITH YOUR PERSONALIZED STAMP ORDER. The order will need to be placed on a debit/credit card, so please include a good contact phone number in your order email. You will be billed the full amount of the order, with a rebate check to follow in 2-3 weeks for the 15% discount. DETAILS: Discount is calculated on Merchandise Total only, all shipping and tax must be paid by customer. Personalized Stamp orders placed for this special will be delivered to me first--I will mount them, and then mail them to you via US Postal mail, with a minimum shipping fee of $2.50. Priority Mail service is available for a $5 fee (for each flat rate envelope required for order shipment), Delivery Confirmation is free, and Postal Insurance is available at cost, upon request. All orders and payment for orders must be finalized and available for process no later than July 31st at 10pm MST, and demonstrator shall not be liable for discounts on orders which do not meet the deadline. 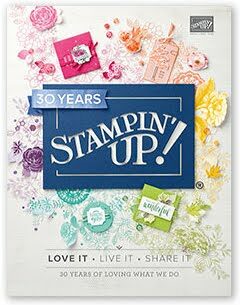 Every week in July, Stampin' Up! is offering a sizzlin' hot Summer Fun Deal of the Week. There are no limits, and there is no minimum purchase required! 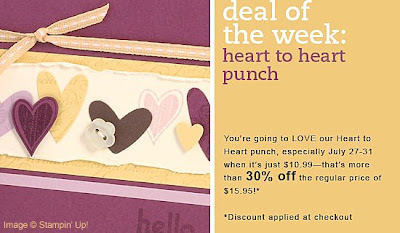 Get your Heart to Heart Punch for only $10.99 this week! The Heart to Heart Punch will cut out 3 hearts at one time! 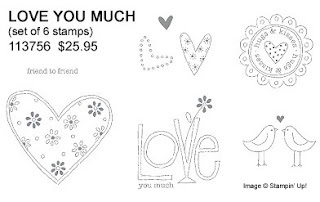 Use it with the Love You Much stamp set (pictured below, not at actual size) for quick die-cut projects. 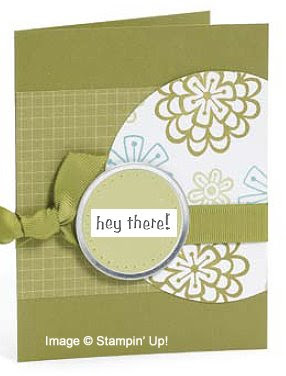 The Scallop Circle Punch (Item 109043, $15.95) also coordinates with the Love You Much stamp set, so you may want to add that to your order! Yes, that means you get 15% off the $10.99 price of the Heart to Heart Punch, as well as anything else you add to your order! Order now, to get your punches and coordinating stamp set, and any other new products you'd like, before this SIZZLIN' HOT DEAL is over! I highly encourage you to place your order through my ONLINE STORE, to ensure you finalize your purchase prior to the ordering deadline of 11:50pm MST on July 31st! However, you may also call me at 719-205-5957 or drop me an email to get your order placed. *Online Orders will receive their 15% off in the form of a rebate check, approx 2 weeks after purchase. 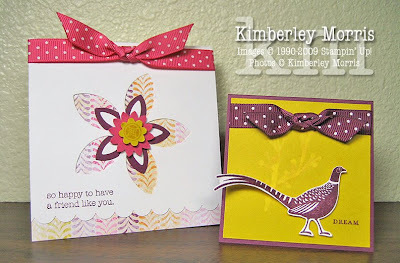 Today I'll finish showing you the samples I made at the shoebox swap last Monday night. These are all really awesome cards, but sometimes I kind of screw something up, and end up changing the card a little when I get home...so if you see a card you designed and it's different, that's why! There's so much to see in the new catalog, and through July 31st I am offering a personal 15% OFF SALE* on all your purchases! So, go browse through my ONLINE STORE and buy the products you can't live without for another day--before you have to pay full price again! You are welcome to email me, or call me at 719-205-5957 if you have any questions, need some help finding what you want, or if you'd like me to place your order for you. Last week I went to a Shoebox Swap with some other local demonstrators. A Shoebox Swap is where everyone makes up a card, and cuts up enough supplies for everyone else to make their card, then we bring the supplies in a shoebox and everyone gets to make everyone else's card. We don't actually swap the shoeboxes, we just pass them around! 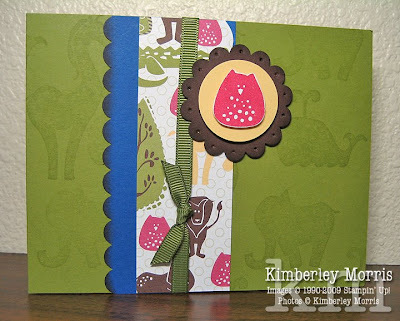 These three cards were all made using the new Animal Stories stamp set. 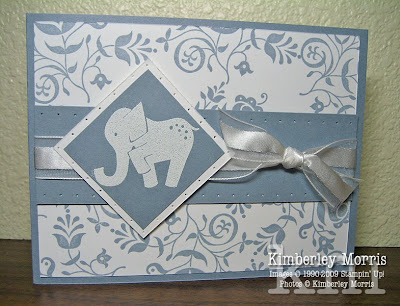 The elephant card also features an image from the Razzle Dazzle stamp set, in the background...I think that one's my favorite of the three. 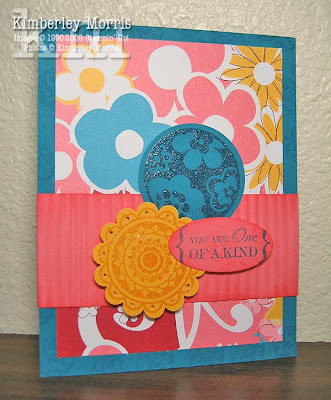 I didn't have to come up with the ideas, I just stamped my cards using the supplies provided for me in the shoebox. How great is that!? 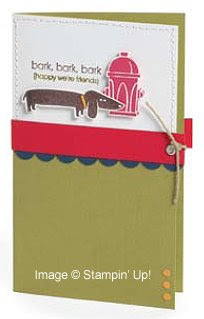 To get your Animal Stories (and/or Razzle Dazzle) stamp set, or any of the other supplies featured on these cards, give me a call at 719-205-5957, or email me to place your order. You may also order anytime through my ONLINE STORE. Ever have one of those days? Of course you have! I had one last week, and it's taken me a while to recover. I'm getting back on track now, and wanted to share a quick card. When I say 'quick', I mean I took out my new supplies, assembled stamps, used brand new product for the first time, came up with a new technique (new to me at least), designed the card, and then ran pieces through my Big Shot and cut up enough card stock for 14 more people to make this card...in less than 2 hours. So, if you're making this at home, with my card for a cheat sheet, I can't imagine it would take you more than about 5 minutes to get this done! My color inspiration came from a Bed Bath & Beyond circular that was lying on my desk. I used Bermuda Bay, Melon Mambo, Green Galore, and Whisper White. Another couple of colors I saw used with this combo in the circular were Basic Black, and Night of Navy, so you may want to give those a try, too! 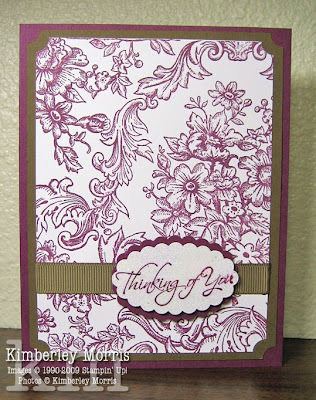 The only real trick to this card is using Sponge Daubers to color the raised dry embossed floral and flourish details. You'll want to dab your Sponge Dauber in your ink pad, then dab the color off until it's almost not there. You can do this on a paper towel, or just scratch paper. 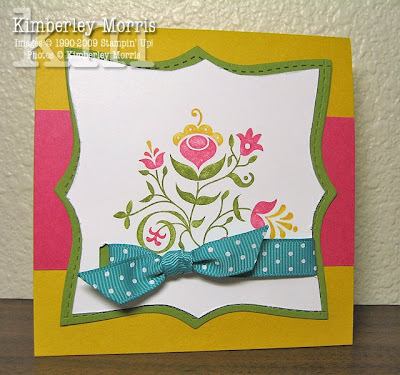 Then you pounce over the raised area where you want the color, twisting your dauber ever so slightly as you make contact with the card stock. Try to dab lightly, so most of your contact is made on the raised part. The trick is to keep the color LIGHT on your dauber, so that you can build up the color. You can always add more, you just can't take color off. 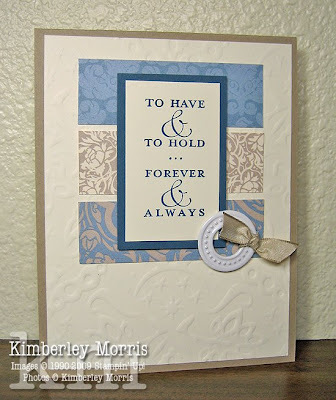 Practice on scrap pieces of dry embossed card stock first. 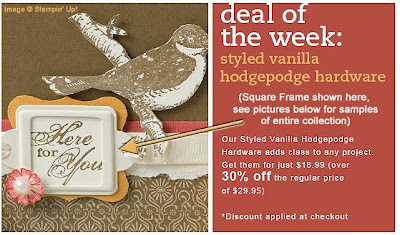 Get your Styled Vanilla Hodgepodge Hardware for only $18.99 this week! Styled Vanilla Hodgepodge Hardware comes packaged in the reusable turquoise tin shown above. The tin is approximately 5" x 7" x 1-1/8", with a hinged lid. The picture beside the tin shows each of the different designs of the hardware pieces you'll get. These metal hardware pieces feature a vanilla (off-white) finish. There are 5 types of frames, 4 types of designer brads, 1 type of flower ribbon slide, and 1 type of plainly styled 3/16" brad. You get 10 of each of those different items, with the exception of the 3/16" brads--you get 100 of those--for a total of 200 pieces of hardware in one nifty, extremely frugal, little package! The Designer Frame and the Oval Frame both feature milled, raised decorative dots around the edge. Three of the hardware pieces coordinate with three of our punches: Designer Label Punch (107590, $15.95), Small Oval Punch (107304, $15.95), and the 1" Circle Punch (109046, 10.95). You will also want the 1/16" Handheld Circle Punch (101227, $8.95) to punch holes those tiny holes in just the right size for those 3/16" brads. You may also want to gently sand the vanilla color from some of the frames, for a vintage look. In that case, be sure to add a package of (2) Sanding Blocks (103301, $$3.50) to your order. Yes, that means you get 15% off the $18.99 price of the Hodgepodge Hardware, as well! Order now, to get your hardware and punches, and any other new products you'd like, before this SIZZLIN' HOT DEAL is over! I highly encourage you to place your order through my ONLINE STORE, to ensure you finalize your purchase prior to the ordering deadline of 9:50am MST on July 27th! However, you may also call me at 719-205-5957 or drop me an email to get your order placed. 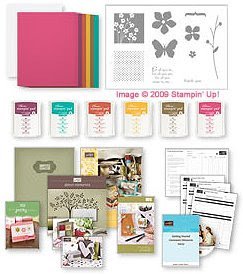 There is a list of stamp sets which are not pictured in the current catalog, but which you still may purchase throughout the catalog year--they are on a list called the Dormant List. Click HERE to view, or right click to download, the Dormant List. 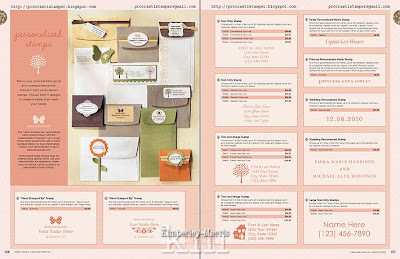 As for me, the Garden Greetings stamp set (113716, $21.95) and the Really Retro sayings stamp set (113754, $14.95) are on my must-have list! As always, just give me a ring at 719-205-5957 if you have any questions, or drop me an email. You can order anytime in my ONLINE STORE! 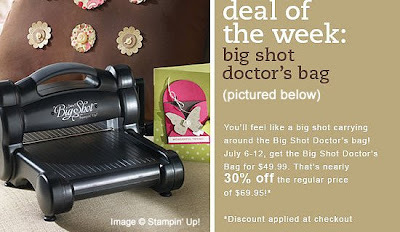 Get your Sizzix Big Shot Doctor's Bag for only $49.99 this week! The Doctor's Bag dimensions are 14-1/2" x 12-1/2" x 13", and it holds the Big Shot, cutting pads, and a number of dies of all sizes. It is made of polyester, vinyl, and nylon, with cast zinc rings and hooks. There are 2 outside pockets, mulitiple inner pockets, and a detachable strap for carrying. 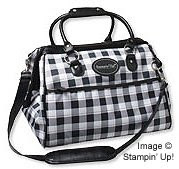 Skid pads protect the bottom of the bag from scuffing. 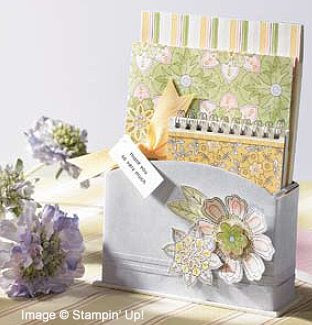 This is a great tool for carrying and sharing your Big Shot and dies during a crop or other crafting get-together. I highly encourage you to place your order through my ONLINE STORE, to ensure you finalize your purchase prior to the ordering deadline of 9:50am MST on July 13th! However, you may also call me at 719-205-5957 or drop me an email to get your order placed. 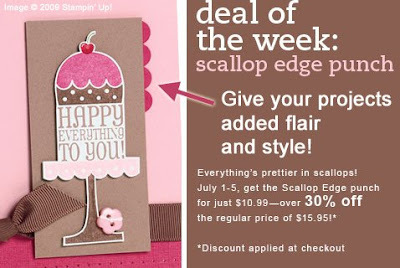 This week's Deal of the Week is the SCALLOP EDGE PUNCH. 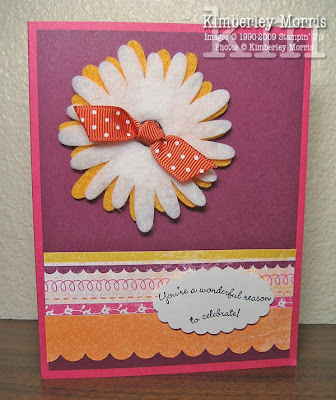 Get your Scallop Edge Punch for only $10.99 this week! I highly encourage you to place your order through my ONLINE STORE, to ensure you finalize your purchase prior to the ordering deadline of 9:50am MST on July 6th! However, you may also call me at 719-205-5957 or drop me an email to get your order placed. Both the Standard Starter Kit, and the Mini Starter Kit, are completely customizable. You can choose the default options pictures in the kits, or order the stamp sets, ink colors, and paper colors you want! Both Starter Kits come with the same amount of business supplies and tools. You can check out THIS POST for a more detailed explanation of benefits, but right away you'll enjoy 20% of all your personal purchases as a Demonstrator! And, when you're running a business, your Starter Kit, and all your business expenses can be taken as tax write-offs! 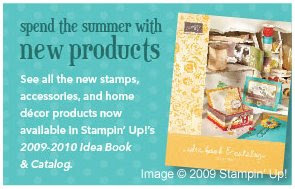 Plus, if you sign up before July 10th, you will be able to REGISTER TO ATTEND THE STAMPIN' UP! CONVENTION, which will be held August 5-8 in Salt Lake City!!! 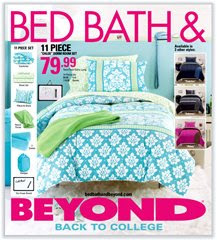 All your favorite products are in here, plus some new ones, and some new colors, to keep everything fresh and vibrant. 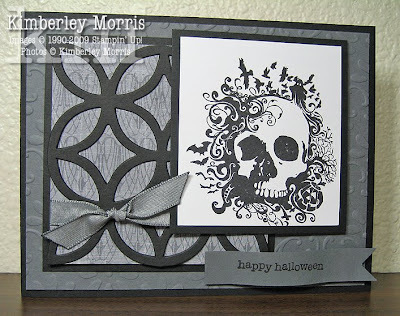 There are new collections everyone will love--from kids birthdays, to weddings, to Christmas, and Halloween! 2) FREE with a purchase of $75 or more! As always, please feel free to call me at 719-205-5957, or email me at any time, with your questions or order!